Every year, with the coming of fall I’m looking to the state’s resources on when one particular season starts: Hunting Season. And we’ve got our fair share of seasons up here in the Great State of New Hampshire. It runs the gamut with Spring, Summer, Fall and Winter, but then there’s those pesky intermediate seasons like Black Fly Season. Or Mosquito Season. Or Horsefly Season. Or Mud Season. Grilling Season. And of Scotch Season! But each state has outlined on their Fish and Game website’s when Hunting Season starts and stops and of course there are different layers of what kinds of game and “artillery” us Mountain Bikers’ need to be aware of when in the woods. And I think this is a really important issue to be aware of when taking to the woods in the fall and winter no matter where you live or what kinds of outdoor activities you partake and enjoy. For me, I’m in the woods just about 4-5 days out of the work week. Maybe more. So here’s what I’ve come to learn from living in two states, growing up in Pennsylvania and calling New Hampshire home, both of which enjoy pretty active Hunting Seasons. 1. Assume every gun to be loaded. Consider any firearm you have not just unloaded to be loaded and treat it accordingly. 2. Control the muzzle–point guns in a safe direction. You must decide what the safest available muzzle direction is and keep your firearm pointed in that direction. Never point a firearm at yourself or others. 3. Trigger Finger–keep your finger off the trigger until ready to fire. The natural instinct when picking up a firearm is to put your finger in the trigger guard. DON’T! This could cause an accidental discharge if the gun is loaded. 4. Target–be sure of your target and beyond. Never point your firearm at something you do not intend to shoot. Make sure you positively identify what you are shooting at and know what lies in front of and beyond it. Do not use telescopic sights as a substitute for binoculars when identifying persons, animals or objects. 1. A firearm is NOT a toy. It’s designed for 1 thing and 1 thing only. That’s it. Treat them with the utmost respect. 2. Never store a firearm loaded. Always keep the ammunition separate from the firearm and that includes the clip if it has one. 3. While the firearm is not in use, always have the safety in the “on” position. 4. NEVER point a firearm at another human. EVER. Even if you’re “joking”. It’s not funny. 6. When firing a rifle, anyone around you should be behind you. Never walk in front of someones line of sight if you are around someone using a rifle. 7. When firing a rifle, sight your target AND sight what is in front of AND behind your target (this is an important one for the post). 8. When finished, remove the clip and check the action/breach so that it is clear. Safety is on. Muzzle is pointed in a safe direction. So you’re out in the woods on a fine fall afternoon. You’ve got your blaze orange on. You’re on your favorite trail riding in your local network. All of the above should be on that Hunter’s or shooter’s “to do list”. But some times things just don’t work out “just so”. Actually, in many cases things work out in less than ideal circumstances and you’re left to make the best of things. As they say the best offense is a good defense. So here’s some things I’ve learned over the years to help mitigate encounters and help minimize your exposure. Step zero is to understand what the dates are for your states hunting season. Here’s New Hampshire’s hunting season dates actually. And I wear blaze orange a good couple of weeks before anything starts just in case some one is out “warming up” which every once in a while I’ve run into. Not so much in recent years, but I play it ultra safe when it comes to hunting season and blaze orange. Step one is to adjust your ride time. By adjusting your ride time, you are less likely to be in the woods when Hunters are in the woods. Speaking with some friends who hunt (I do not), most take to the woods early in the morning or later in the day (say around 4/5pm). This coincides with game browsing and foraging times basically. Here’s some additional info on times. In essence, you’re minimizing your exposure by removing yourself from the woods during peak potential times that hunter’s may be in the woods. It’s never a perfect strategy as you can get some random zingers like these fellow mountain biker’s experienced in Washington state. That was a close call and the shooter was being COMPLETELY irresponsible. Definitely not sighting in front of and behind their target… But in addition to adjusting your ride times, be really aware of your surroundings when in the woods during hunting season. Many hunters in my area who do know of the trail network will use them as access points to their preferred spots. But that’s no guarantee that they know where all the trails traverse. Step two is your gettin’ your blaze orange on. It’s the end all be all color choice in fall. Luckily, it seems many cycling company’s have been offering up some nice bright colors as of late. But many company’s have been making hunting vests that are actually nicely fitted like this one from Under Armour of all brands (which I own – not sure of that new logo on the back though… mine is just blank). I’ve also taken to finding other spots to festoon in orange. Water bottles like these from Swallow Bike Shop. Or orange gloves like these from Fox! And last but not least.. your helmet which I just picked up a new Giro Fathom which is the Atmos with a visor AND it’s in orange this season. Up above you’ll also note I have a vest from Giro which was offered in orange at the time but I also picked up a new soft-shell jacket from 7Mesh, the Recon which comes in a nice burnt orange color and fits like a glove. (more on this one at a later date) So you can basically coat yourself in orange or pick and choose hits of color. The big objective here is to be seen and having a blaze orange piece like a hunting vest of some sort is your best option to wear over your existing kit. And Step three is what to do when you run into a hunter? Well, play it cool for starters. I’ve been yelled at plenty of times by hunters which is not cool and my best course of action was to stay calm, introduce myself and try and bring tempers down to a conversation instead of a yelling match. In some rare cases, you have to yell to let others know of your where about’s. But most times, both you and the hunter are just as surprised to find each other. So what I typically do is start the conversation with an apology that I didn’t mean to sneak up on them, and follow it up with “Beautiful day out today. Where are you headed? Did you spot anything yet?” See what I did there? I commented on something we’re both thinking but then flipped the conversation to them asking them questions about their day and if they’ve had any chance to see any thing. After all, that is what they’re out in the woods to do.. Spot wildlife. But I want to know where they’re headed so I can go the complete opposite direction. I keep my rides up in the air a bit during hunting season so I can adjust where I’m headed (we have a lot of options here). But by welcoming conversation and asking them how their day’s going, you invite civility. A lot of times I get the hunter asking me if I’ve spotted anything so they can orient themselves too. Generally they’re all good conversations but it’s best practice to play it cool and take the high road in conversation. No one wants their day spoiled and an argument is no way to start your day… especially when you’re both out enjoying time in the woods. In summary, what you need to do to be safe during hunting season is to know your dates. Then understand the prime times for hunting to adjust your schedule to minimize your exposure. 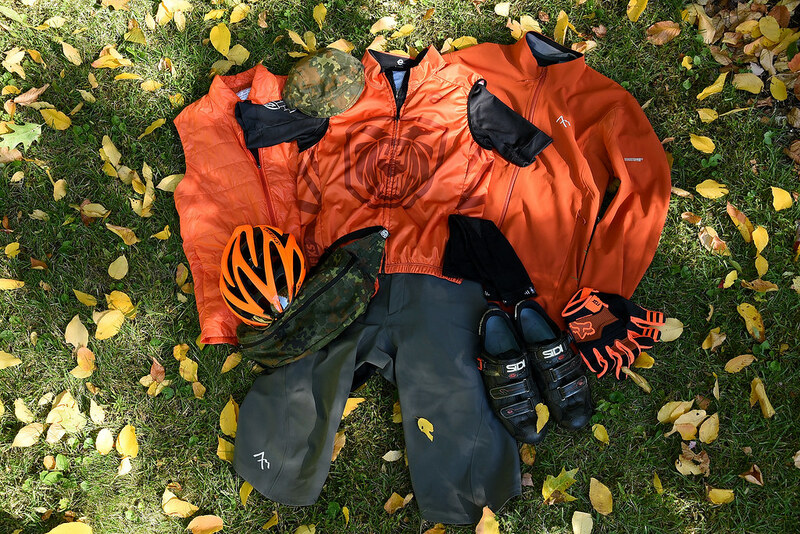 Get your blaze orange game on point and suit up appropriately to be seen. Finally, if you do bump into a hunter, play it cool. Introduce yourself and say hello. Speak in a conversational tone if you’re in earshot and invite civility. The rare occasion you may have to yell to be known but again, play it cool at all costs. Spread mountain bike love not hate. Be safe and Swear to Shred.